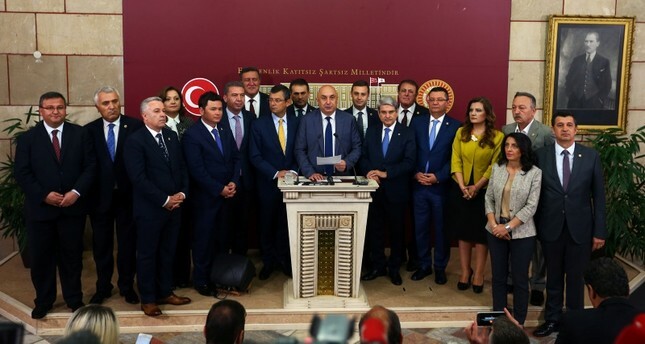 The 15 deputies who have resigned from the main opposition Republican People's Party (CHP) and joined the Good Party (IYI Party – IP) on April 22 in a controversial move to grant the latter the right to participate the snap elections on June 24 returned to CHP Thursday. Speaking at a news conference in the parliament in Ankara, CHP Deputy Group Chairman Engin Özkoç said that the deputies fulfilled their duties and are returning to their party. The collaboration between the parties was based on a possible veto by the Supreme Election Board (YSK) on IP since the party was recently established and did not meet the requirements to participate in an election. The transfer of 15 deputies from the CHP to the IP allowed the latter – having five deputies at the time – to reach 20 deputies in the parliament, thus meeting the condition of having 20 deputies to form a parliamentary group and participate in the elections. Hours after the announcement, the YSK issued a statement on parties eligible to be placed on the ballot on June 24, which included IP. However, the transfer between the center-left and secularist CHP and the IP, which includes center-right and far-right figures, was met with criticism by the CHP's left-wing cadres. It was also criticized on ethical grounds by the ruling Justice and Development Party (AK Party) and Nationalist Movement Party (MHP), which have formed the "People's Alliance" in February 2018. On May 2, CHP, IP, Islamist-conservative Felicity Party (SP) and center-right Democrat Party (DP) announced that they will form an alliance in the upcoming elections, whose name was later revealed as the "Nation Alliance." Following the return of 15 deputies, the CHP will have 131 lawmakers in the 550-seat parliament after the departures with the IP decreasing back to six lawmakers.